With boxing's Heavyweight Division somewhat without an identity at the moment, Boston and Tampa Bay did their best Thursday night to give boxing fans something to get into. In the second inning, the Devil Ray's James Shields hit the Red Sox Coco Crisp on the right leg. Yes, the right leg, not the right temple. Anyway, Crisp storms the mound and the "fight" is on. Shields takes the first swing and Crisp dodges the blow. Chrisp gets his shot at Shields just before the Rays DH Jonny Gomes arrives on the scene. Gomes lands several punches while Crisp is under a couple of TB players. From what I've read on line, it was Gomes involvement that has the Sox and their fans upset. I suspect that it was his 'successful involvement' that has them riled. His punches landed. On the Tampa Bay side, this entire incident was a carry-over from Wednesday night. On a double play grounder, Crisp slides LATE and on the far inside of second base, taking out second baseman Akinori Iwamura. Manager Joe Maddon called the late slide an intentional attempt to injure his second baseman. I saw the play live on TV, and it looked like more than the 'normal' break-up-the-double play slide. I have no idea how much malice there was in CC's mind. But here's the thing: I just knew that in Thursday night's game, Crisp would be thrown at. Both of those teams had to know that. They have a bad history against each other anyway. His slide was somewhat questionable. No, it was downright unquestionable. I don't always agree with the commentary of Rick Sutcliffe, but he got this one correct. He as much said it was a dirty play. So Boston, I like your sports teams, but chill out about this brawl. You had to see it coming. Get over it. 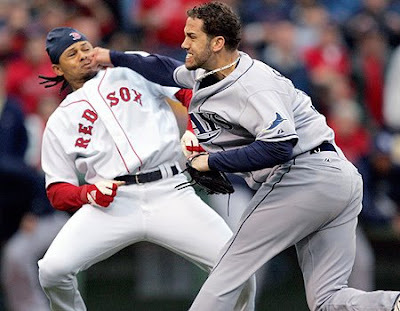 Coco Crisp was not the victim, he was the instigator. You swept the series didn't you? Take your center fielder who sounds like a cereal box and get ready for your next game. No one owes you anything just because you finally won a couple of championships on the diamond. Just keep whipping up on the Yankees; that's all you need to get fired up about. Oh yea, when you release Coco, tell him to call Vince McMahon. He can wrestle as "The Human Cereal Box"!